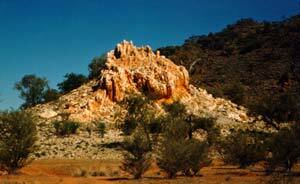 Both Central Harts Range and Harts Range West have Garnet Deposits; these deposits are scattered throughout the ranges. Tailings from the mines are a good place to start, the Rex Mine and Mica Mines in the Mt Palmer Environs, Kismet Mine, Spotted Tiger Mine and the Butcher Bird Mine are good places to try. A number of other gemstones and minerals can also be found at these sites; Muscorite, Smokey Quartz, Biotite, Rose Quartz, Aquamarine, Clear Quartz to name a few. Harts Range Northern Territory, Garnet and Zircon fields. The best advice is to obtain a Northern Territory Fossickers Licence along with the detailed maps produced from the Northern Territory Government Department of Mines and Energy. A fossicker's licence is compulsory in the Northern Territory, at present there is no cost. Location-the tracks into this area begin 27Klm from the Mud Tank Zircon field turn-off. Travel south for 2.8Klm then turn left and travel for a further 2.0Klm. Turn right down a narrow track for 0.7Klm to a system of creeks. Garnets will be found by digging and sieving the bed and surrounding banks. A second area close to the designated fossicking area is on the Main Track south 6.8Klm (approx.) from the Plenty Highway; a fork in the track indicates another area to dig and sieve. The area can readily be identified by the old digging piles of dirt. Camping is allowed on all designated fossicking land, no facilities are provided and campers must be self sufficient particularly with drinking water and fuel. The Spotted Tiger Campground is a favoured camping area. Fuel, groceries and general supplies are available at a nearby Atitjere Community Store along with bore water. The Spotted Tiger Campground is located in a designated fossicking area known as FA1 on Government Maps. This is a favoured area for fossicking for Garnet; explore the mines in this area. Another favoured spot for Garnet is designated fossicking area FA9. The same conditions apply for camping removal of rubbish etc. this area is part of Mt Riddock Station and the rights of the owners must be observed. Garnets on this site are a deep red colour and look magnificent when set in gold or silver. This area is best suited to 4WD vehicles only.